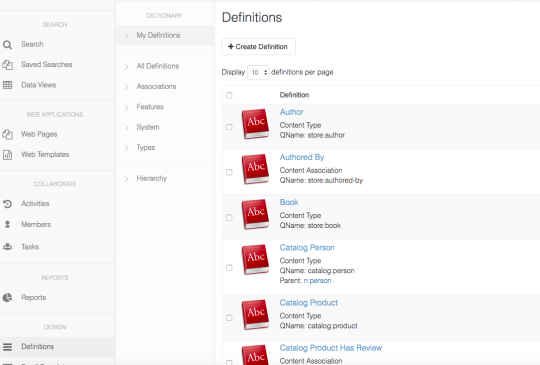 Why is there a need for Bulk Import for existing content into a CMS? Content is extremely valuable and expensive to recreate. It’s too valuable to lose and recreating it manually can be a daunting prospect. Your existing content is an important concern at the start of any CMS project – how to migrate content and the related costs is a very important consideration. and additional migration costs are not incurred. One-time “bulk import”, eg. Initial Content Import. Quite often you’ll have a lot of your content in a digital format at the beginning of your project, and, depending on how much there is, this content can be time consuming to enter. “Incremental Import” scenarios. Regular updates from external systems: it would be nice if all content was ‘happily’ in one internal system and only managed in one place. Unfortunately this ideal world doesn’t always exist: typically, CMS initiatives are in phases – one project at a time, or 3rd party content, eg. external product updates. This means that at times some content is managed externally and will need to be imported or updated at regular intervals. 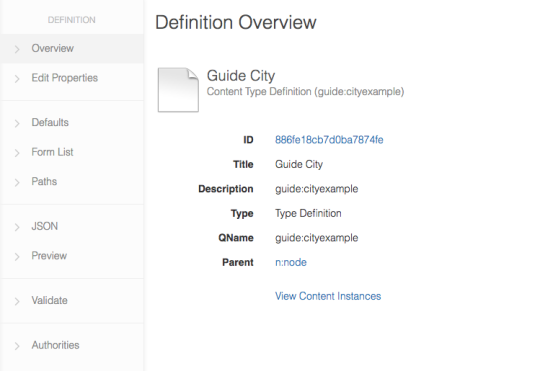 Cloud CMS provides a command line tool (https://www.cloudcms.com/documentation/api/content-services/bulk-import) that you can use to bulk import data into your content repository branches. This allows you to migrate existing data into Cloud CMS within a single transaction – everything goes in or nothing goes in (transactional). This process is intended to support one-time “bulk import” scenarios as well as “incremental load” scenarios. The bulk import mechanism allows you to programmatically enter your pre-existing content, saving time and reducing the errors that can happen when doing repetitive content entry. Bulk import does suggest large numbers of records to be imported. We have tested the Cloud CMS Bulk Import process with hundreds of thousands of records. It worked well and fairly quickly. If you have a large content import then please contact us to discuss or assist. Cloud CMS introduces a Single Sign-On service that will make it easy for the users to connect using their already existing business accounts. 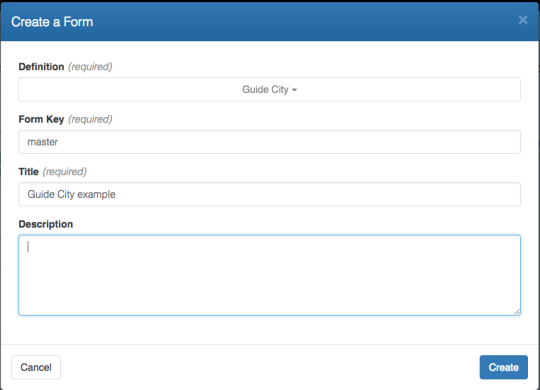 Cloud CMS supports two Enterprise SSO features – SAML 2.0 and JWT. These are two popular SSO mechanisms that work with many commercial and open-source identity providers including Microsoft Active Directory Federation Services (ADFS), JBoss Keycloak etc. Using SAML 2.0 and JWT, Cloud CMS can be easily integrated with your corporate security infrastructure. Users who log in using either SAML or JWT will have their accounts automatically created and synchronized within Cloud CMS. Cloud CMS will not have any password information stored since the username/password sign on happens somewhere else. 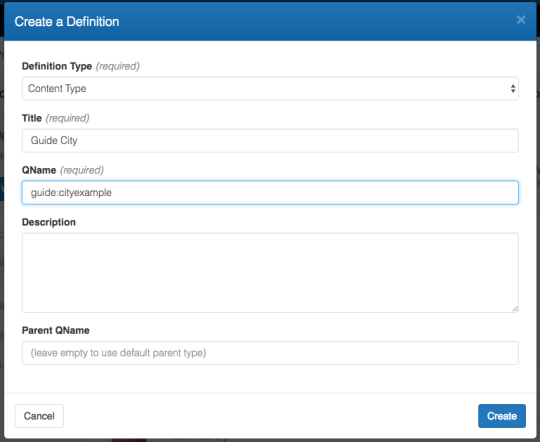 Not just the custom user properties but even the groups from either the JWT payloads or SAML assertions can be mapped into Cloud CMS letting the information be synchronized. On the left-side, select Platform Settings. On the sub-menu, select SSO. 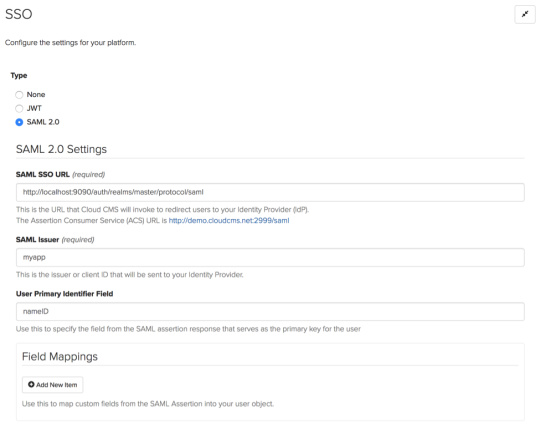 To enable SSO using SAML, select “SAML 2.0” from the selection list. Next step is to configure the settings like providing the URL of the Identity Provider you want to redirect to and the field mappings which lets you synchronize the user properties from the identity provider into Cloud CMS. Go to Platform Settings > SSO. 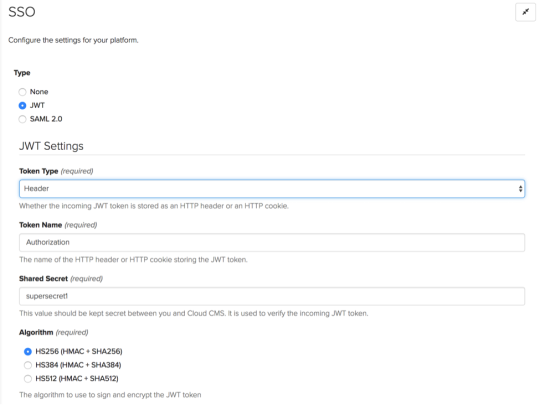 Once the JWT is configured, requests coming into Cloud CMS are expected to have a header or a cookie that contains a JWT token. This token is used to identify the user and also map the user properties with Cloud CMS to have synchronization. Provide the necessary information as above. Further, you can provide the field mappings to synchronize the user properties of JWT profile fields into Cloud CMS. While logging in again, the system will check whether the JWT token is found and is valid. It can also be redirected to a remote login. Visit the documentation for more information.